Kimberly Clark is a New Orleans-based drag queen and vlogger with a passion for three things: makeup, storytelling, and spreading happiness. 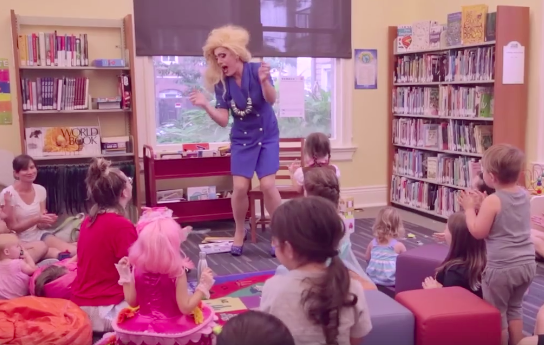 She recently began taking her drag act from the gay bars of the French Quarter to the little local libraries in New Orleans for children’s story hours. “Drag queens are fabulous storytellers for kids because we are these kinds of magical unicorn versions of people that show kids they can be anything they want to be,” Kimberly says. Kimberly just hosted the City’s first-ever “Drag Queen Story Time,” a trend that’s been popping up in other cities around the country, including Oakland, New York, and Los Angeles, though not without some pushback from religious zealots and other antigay fanatics. But Miss Kimberly isn’t concerned about naysayers. She is all about spreading joy and happiness to the kiddos–and looking fabulous while doing so. Over the fashion choices, I’d hope. ? Drag queens make everything better.